Last week a big military plane flew overhead as The Arrow and I were stopped at a stoplight. I asked him where he thought the plane was going, and he immediately yelled "Boston!" from the backseat. I love that he's finally reaching the age where he remembers big events like our trip to Boston this summer. If you ask him what he remembers about Boston, the first thing The Arrow will give you a full report on is the "orange train." Our rental house in Jamaica Plain was a few blocks from the orange line of the MBTA, Boston's main public transportation system. For a suburban kid, riding a subway was a pretty grand experience. I've already written about why I think train travel is so great for getting from one city to another with a toddler. But getting around one city is pretty awesome, too. We actually had time to talk to each other, spend time as a family, tell The Arrow about the things he'd be seeing when we reached our stop, etc. Plus, we didn't worry about traffic, navigation or parking in a particularly un-car-friendly city, nor did we have to drag a car seat on the plane or rent one. 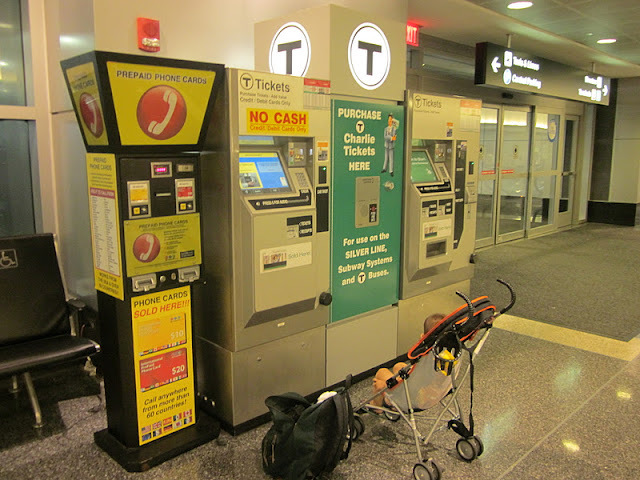 If you're taking public transportation directly from Logan Airport in Boston, I recommend buying your T tickets at one of the kiosks near baggage claim at the airport (pictured below). There were long lines to get tickets at the T station itself and we got to walk right by since I had already bought tickets while we were waiting around for our bags. My husband describes this picture as "that time you abandoned our kid in a busy airport just to get a photo for your blog." 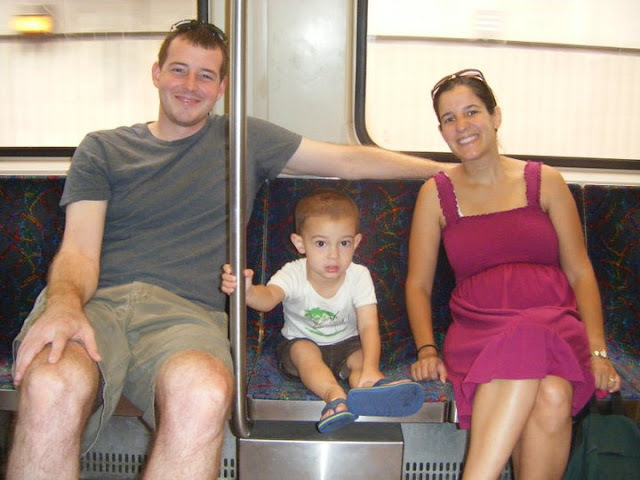 Even older suburban kids are impressed by public transit. When we were in London last year my older daughter, who was 13 at the time, insisted that I take her picture inserting her ticket into the turnstile at a tube station. Because apparently the fact that it popped out the other side was the coolest thing ever! I already bought your tickets for the San Francisco trolleys! This has made me remind me of my trip too to Boston, you are right at this point that train proves the best to travel with kids, this is the best time you can spend with your family to some great discussions.